Put some spice in your next gathering with these great tasting sausage balls. To keep them hot for your guests, spray the inside of your slow cooker with cooking spray, place the sausage balls in the bottom and turn the cooker on keep-warm setting. * They are also great for breakfast or brunch! 1. 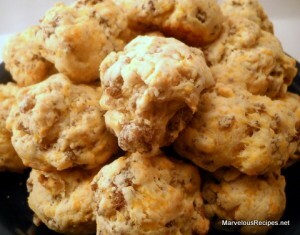 In a large bowl, combine sausage, baking mix and cheese. Combine the bouillon granules and water; blend well. Add the bouillon mixture to the sausage mixture; blend well. 2. Shape into small balls; place 1 inch apart on a cookie sheet sprayed with cooking spray. 3. Bake at 350 degrees F for 12 to 15 minutes or until edges are lightly browned; remove immediately and serve hot. Makes about 6 dozen. * Place a slotted spoon and party picks alongside the slow cooker so your guests can serve themselves.